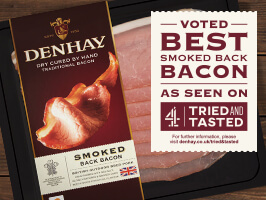 Acclaimed Channel 4 programme ‘Tried & Tasted’ pitted our award winning Denhay dry cured smoked back bacon against 3 other high street brands of bacon. Judged by a panel of experts including award winning butcher Charlotte Mitchell, baker Stacie Stewart, renowned restauranteur Fred Siriex and blogger and TV presenter Lucy Alexander, Denhay beat the competition on flavour, smell and appearance. The series is hosted by none other than Michelin starred chef Michel Roux Jr and revered food critic Jay Rayner, who also placed Denhay on their ultimate shopping list. If you missed the show, fear not, Episode 8 of Tried and Tasted is available on Channel 4’s 4OD player. And of course, if you wanted to buy our ultimate bacon, then our easy to use store finder will help you.